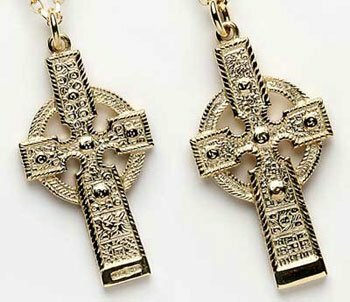 Beautiful Celtic Cross Pendant handmade in sterling silver or gold faithfully captures all authentic detail of the original Cross of Ahenny. 32mm high and 16mm wide. 5g silver weight. 6g gold weight. With 18 inch chain. This cross is a double-sided replica of the original cross. Handmade and hallmarked in Ireland. 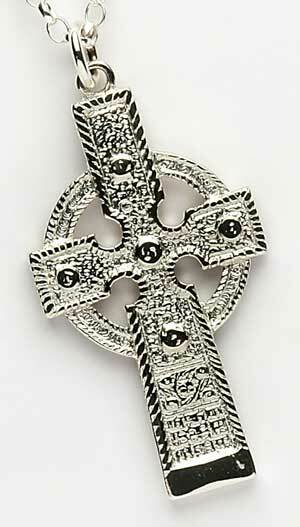 Celtic Cross of Ahenny recreated in stunning detail in this Irish jewelry piece. in the Annals or in any other records to tell us why they are there. persons or large flourishing monastic communities, not burial sites. relief makes us ask "What did the cross look like when it was first erected?" the marvellous work of the sculptor been fully seen and appreciated.